My latest post is up at RightPundits, on Mark Sanford . Go read it, and please leave a comment. The Minnesota Supreme Court has handed down its much-expected ruling in the heavily-litigated Minnesota Senate race from 2008 — and it’s a unanimous one — deciding against Republican former Sen. Norm Coleman’s appeal of his defeat in the election trial and affirming the lower court’s verdict that Democratic comedian Al Franken is the legitimate winner of the race. Do you agree that a fourth ballot box be installed through which the people will decide to convene a constitutional assembly? Yes…….or………..No. This is in direct violation of the country’s Constitution, which forbids the President from calling for changes to the Constitution. Articles 373 and 374 of the Honduran Constitution specifically state that ammendments to the Constitution be approved by 2/3 of the votes in Congress AND specifically forbid any President of the country from extending term limits. The Constitution also says these two articles can not be ammended. The same article at La Prensa states that Zelaya prepared a decree ordering all institutions of the State to bring about the project, which Zelaya deemed “an official activity of the Government of the Republic”. This means that the notion that Zelaya’s referendum was non-binding is false. Zelaya clearly meant to make his Sunday referendum official and binding. La Prensa says the decree, dated June 26, was published Saturday June 27. Many reports in the media make it sound like Zelaya came up with this project with short notice, and was removed with even shorter notice. La Prensa has a lengthy article (in Spanish) itemizing the timeline of Zelaya’s process of trying to bring about the Sunday referendum. Mel Zelaya first brought up “the fourth ballot box” idea on February 17th this year during a parade showcasing several tractors gifted by Hugo Chávez, two days after Chávez’s own referendum extending indefinitely his term in Venezuela. 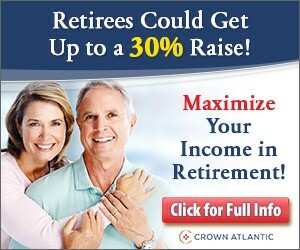 The article is very interesting and has a great deal of information. For instance, in June, while the Tribunal Superior de Cuentas, TSC (Superior Tribunal for Accounts) was being asked to investigate where Zelaya was getting money for the “fourth urn”, Zelaya was denounced at the Public Ministry for not submitting a General Budget to Congress. The Congress vice-president accused Zelaya of diverting 5.5 billion lempiras to finance the fourth urn campaign. Bureaucrats who participated in a demonstration favoring the referendum admitted that they had received 300-500 lempiras for attending. By April the country’s institutions had warned Zelaya that what he was attempting to do was not only unlawful but also would be considered a coup d’etat. He promised the country would hold presidential elections as scheduled in November, and that he would step down in January, when Mr. Zelaya’s term was due to end. Inka Kola has photos of yesterday’s demonstration. Three labor unions supporting Zelaya have scheduled a strike for today. CNN en Español showed another demonstration, supporting new president Roberto Micheletti. 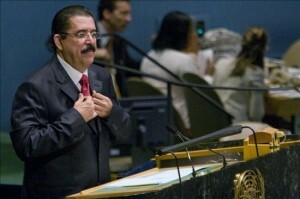 Zelaya is now in New York City, where he will address the UN. He says he’s going back to Honduras on Thursday with OAS Secretary General José Miguel Insulza and Argentinian president Cristina Fernández. I have no idea why Fernández wants to inject herself into this. Her party was resoundedly defeated in last Sunday’s congressional elections. Micheletti and the Honduran Congress have stated that Zelaya will be arrested upon arrival. There was a coup all right, but it wasn’t committed by the U.S. or the Honduran court. It was committed by Zelaya himself. He brazenly defied the law, and Hondurans overwhelmingly supported his removal (a pro-Zelaya rally Monday drew a mere 200 acolytes). Yet the U.S. administration stood with Chavez and Castro, calling Zelaya’s lawful removal “a coup.” Obama called the action a “terrible precedent,” and said Zelaya remains president. The U.S. response has been disgraceful. “We recognize Zelaya as the duly elected and constitutional president of Honduras. We see no other,” a State Department official told reporters. Worse, the U.S. now contemplates sanctions on the tiny drug-plagued, dirt-poor country of 7 million, threatening to halt its $200 million in U.S. aid, immigration accords and a free-trade treaty if it doesn’t put the criminal Zelaya back into office. Not even Nicaragua, a country the State Department said committed a truly fraudulent election, got that. Nor has murderous Iran gotten such punishment, even as it slaughters Iranian democrats in the streets. But tiny Honduras must be made to pay. We understand why the White House is so quick to call this a “coup” and to jump to the side of Hugo Chavez. The Venezuelan despot has made political hay against the U.S. over its premature recognition of the Venezuelan coup leaders who tried to overthrow Chavez in 2002. Obama wants to avoid that this time. The White House also wants to mollify the morally corrupted Organization of American States, which, by admitting Cuba, is no longer an organization of democracies and now, through its radical membership, tries to dictate how other countries run themselves. Such a response says that democracy effectively ends with elections. It says rule of law is irrelevant and that rulers have rights, not responsibilities. But if leaders can’t be held accountable, they should be removed, as happened in Honduras. If the U.S. does hit Honduras with sanctions, it will earn ill will in the country lasting for years. It will further erode U.S. moral authority and cost us influence in the region — becoming an embarrassing footnote in the history of U.S.-Latin American relations. This underscores a harsh reality for Latin American believers in liberal constitutionalism. Deep down, only Presidential Power is considered real power in Latin America, which is why only moves against the president are considered actual coups. Our constitutions generally define all branches of government as equal, but it seems some are more equal than others. It’s precisely because such attitudes are so widespread in the region that Honduras’s political class panicked when faced with a president determined to make his power permanent. And while it’s true that, in their reaction, the generals stepped beyond constitutional boundries, the hard line the Obama administration has taken against the Honduran coupsters needs to be balanced with a realistic assessment of where the deeper threat to Latin democracy comes from these days. Under Fidel Castro’s iconic shadow and Hugo Chávez’s day-to-day leadership, a new generation of authoritarian leftists has mounted a concerted campaign against the kinds of constitutional checks and balances that make liberal democracy viable. Honduras’s political class grasped clearly that to allow Zelaya’s charisma to trump the nation’s explicit constitutional ban on presidential continuismo would be to open the door to the kind of institutional involution that Venezuela and Bolivia have experienced, with a hyperempowered executive gradually eating away at the other branch’s prerogatives until nothing of the Republic is left. Don’t miss also Michael Goldfarb conversation with Ambassador Otto Reich. Later today I’ll be in Ed Morrissey‘s, Silvio Canto‘s and Rick Moran‘s podcasts, and will continue to update you on this story. The best that can be said about our president’s involvement in this issue is that it risks transforming a difficult situation into a disaster. Absent US pressure (never mind US support) the Honduran political scene would likely return to something like normal, with popular and media focus shifting from the deposed Zelaya to the coming elections. By getting involved in support of Zelaya we probably make a drawn-out crisis inevitable, and we green light further subversion of Honduran democracy by Chavez and Ortega. In the worst case a military insurgency or civil war supported by the dictators is conceivable. That would be a catastrophe. Miguel Octavio wants to know Why is Zelaya’s Constitutional coup attempt ignored by the world? Mel Zelaya addressed the UN General Assembly appealing for international support for his reinstatement, and claimed he didn’t intend to run for a second term. Another Honduran politician named Zelaya writes on the Very Constitutional Coup. More commentary and analysis at Mcauley’s world (via Neo-neocon and Frontline). Colombia, America’s strongest ally in the hemisphere, needs the Free Trade Agreement with the US finalized. The agreement will end tariffs paid by US producers selling to Colombia, and will also send a message of support to the anti-Chavista forces in the region. U.S. President Barack Obama expressed hope that Congress would eventually approve a long-delayed free trade agreement with Colombia, but said that country needed to make more progress on human rights first. “There remains work to do. 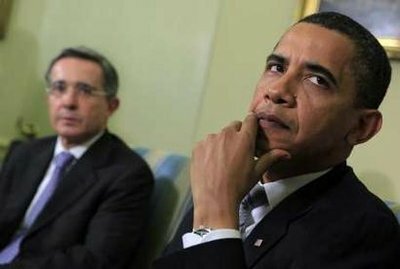 But I’m confident that ultimately we can strike a deal that is good for the people and good for the people of the United States,” Obama told reporters after a meeting with Colombian President Alvaro Uribe. In remarks in the White House Oval Office, Obama said he did not have “a strict timetable” for submitting the trade deal to Congress because he already had a busy legislative agenda this year and needed to consult with lawmakers first. You don’t expect the FTAs with Peru and South Korea are going to be finalized any time soon, do you? In today’s podcast at 11 AM Eastern, I’ll talk about about Cristina Fernandez‘s losses in last Sunday’s Argentinian Congressional election. Thank you to all the visitors, commenters, and bloggers linking to my coverage of yesterday’s events in Honduras. This is why Zelaya was removed from power: all branches of government and the country’s institutions recognized that he had broken the law. Again, the military – by placing him in an airplane to Costa Rica early Sunday morning before he carried through the unlawful poll – acted in compliance with the Supreme Court and the Honduran Congress. Former Argentine Ambassador to the U.N. Emilio Cárdenas told me on Saturday that he was concerned that “the OAS under Insulza has not taken seriously the so-called ‘democratic charter.’ It seems to believe that only military ‘coups’ can challenge democracy. The truth is that democracy can be challenged from within, as the experiences of Venezuela, Bolivia, Ecuador, Nicaragua, and now Honduras, prove.” A less-kind interpretation of Mr. Insulza’s judgment is that he doesn’t mind the Chávez-style coup. because, in Honduras’s case, the military has been endowed with a role in maintaining democratic governance; this time their task was to delivery Zelaya safely out of office and into the airplane to Costa Rica. However, as you can read in the comments section to yesterday’s post, and reactions from Hondurans abroad, Hondurans are very supportive of the Honduran government’s action. As I blogged yesterday, Hugo Chavez put his troops on alert and pledged to overthrow Roberto Micheletti before Micheletti had even been sworn as president. Chavez is in full bombastic mode, blaming the US for the coup even as the United States considers President Manuel Zelaya to be the only constitutional president of Honduras. There are reported Venezuelan and Nicaraguan nationals – possibly military – trying to enter Honduras through isolated areas in the countryside. Honduran daily La Prensa reports that Venezuelan agitators are leading demonstrators in the capital. The ALBA countries, all Chavez sympathizers) have withdrawn their ambassadors from Honduras. Chavez flew Zelaya from Costa Rica to Nicaragua to join the ALBA summit. I’ll continue following up on this story. Please keep coming back for updates. The Carnival of Latin America and the Caribbean will be up tomorrow. the U.S. is not demanding that deposed President Manuel Zelaya be restored to office. She also said the military coup has not triggered an automatic cutoff of U.S. aid to Honduras. Clinton told reporters at the State Department that a delegation from the Organization of American States will be heading to Honduras as early as Tuesday “to begin working with the parties” on the restoration of constitutional order. Whatever that means. The fact remains that the Honduran government and the institutions remained intact – only Zelaya was ousted. …in Honduras, going all the way back to the 1840s, battalion commanders had not only a military-command responsibility, but a civilian law-enforcement responsibility. They were closely equivalent to American sheriffs in many regards. Because of their ordinary roots, battalion commanders, officers and their soldiers were much less “classed” than elsewhere in Latin America. There never formed a significant rift between the people and the military. Though attenuated nowadays from days of old, the Honduran army has long had a traditional role as keeper, and sometimes guardian, of civil order and has been viewed by the people as such. What the Honduran army did last week in shoving Zelaya, a would-be puppet of Venezuelan strongman Hugo Chavez, out of office was not a coup by even the wildest imagination. It was Zelaya who was trying to mount a coup, by using an unconstitutional referendum (with ballots printed in Venezuela!) to justify remaining in office as long as he wanted. No one in government, including his own party, supported Zelaya. In fact, the Honduran Supreme Court actually ordered the army to remove him, a perfectly sensible development because of the historical role of Honduras’ military in civil order. If the Obama administration had stopped to consider Honduran history and culture (or had the State Dept. paused even to consult its own experts, it would not (one supposes) have been so quick on the trigger. But instead, it practiced “ready-fire-aim,” though without the aim, even too late. 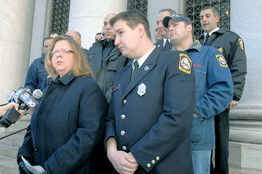 The Supreme Court, voting 5-4 in a case that has been a lightning rod for high court nominee Sonia Sotomayor, invalidated a Connecticut city’s decision to scrap the results of a firefighter promotion exam in which the white candidates scored better than their black peers. While employers should actively work to create fair paths to promotion, they may not overturn tests based on the results, moderate conservative Justice Anthony Kennedy wrote in the court’s opinion. “Once that process has been established and employers have made clear their selection criteria, they may not then invalidate the test results, thus upsetting an employee’s legitimate expectation not be judged on the basis of race,” Kennedy wrote. The court’s four other conservative justices joined Justice Kennedy’s opinion. Assuming Sotomayor is confirmed, her presence on the Court would have made no difference in Ricci, since she is replacing Souter. The 5-4 split likely will give Sotomayor’s supporters comfort, since while she would have been in the minority, several current Supreme Court Justices agreed with her conclusion in the case. Nonetheless, there is plenty of fodder for Sotomayor’s opponents, both in the rejection of her position by the Court and her failure to deal with these issues head on, deferring instead to a lower court’s opinion. although there is a sharp 5-4 divide among the justices, not a single justice thought that Judge Sotomayor acted correctly in granting summary judgment for the City of New Haven. The dissent grants that petitioners’ situation is “unfortunate” and that they “understandably attract this Court’s sympathy.” But “sympathy” is not what petitioners have a right to demand. What they have a right to demand is evenhanded enforcement of the law—of Title VII’s prohibition against discrimination based on race. And that is what, until today’s decision, has been denied them. Check out Bench Memos for more on this case. The irony of the case lies in Ricci, who is dyslexic, having rejected favoritism under the Americans With Disabilities Act, finally prevailing but after the expense and strain of taking his case all the way to the highest court in the country. Identity politics is, in a word, wrong. Argentine President Cristina Fernandez de Kirchner lost power in Congress after voters angry at her handling of a farm strike, crime and a slowing economy favored opposition candidates in mid-term elections yesterday. Nestor Kirchner, Fernandez’s husband and predecessor, acknowledged this morning that a slate of candidates he led for the lower house of congress in the bellwether province of Buenos Aires was defeated. Partial results indicate the government will lose its majority in both houses of congress, with no party having outright control. She had had the election moved up four months, probably in the hope that economic conditions now would be better than later, but it didn’t work. Fernandez and Kirchner, as you may recall, are big friends of Hugo Chavez, who sent her a suitcase filled with $800,000 to finance her prior campaign. All in all, Hugo’s had a hell of a weekend. 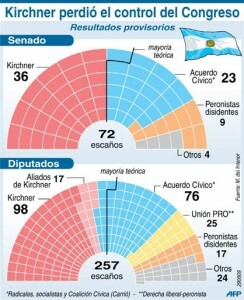 Following the defeat, Néstor Kirchner resigned as leader of his Partido Justicialista (PJ) political party.